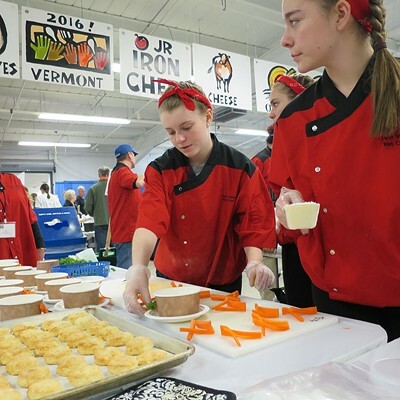 Vermont has many talented young cooks. I know this because on a recent Saturday in March, I sampled outstanding dishes prepared by chefs in the under-18 set. 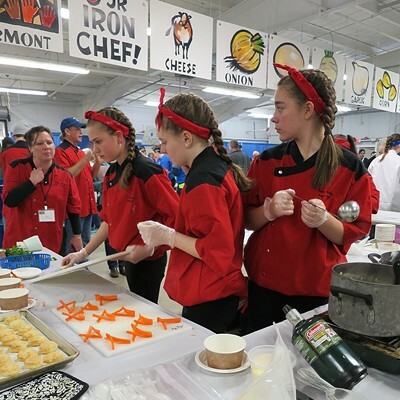 Though most were too young to drive, the 240 knife-wielding teens and preteens brought skills to the Jr Iron Chef VT competition. 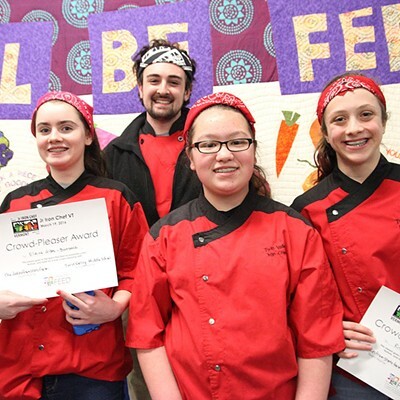 While the title references the hyped-up reality TV show, the goal of the junior contest is more community minded: to cook meals that can be used in, or inspire, school-lunch programs. 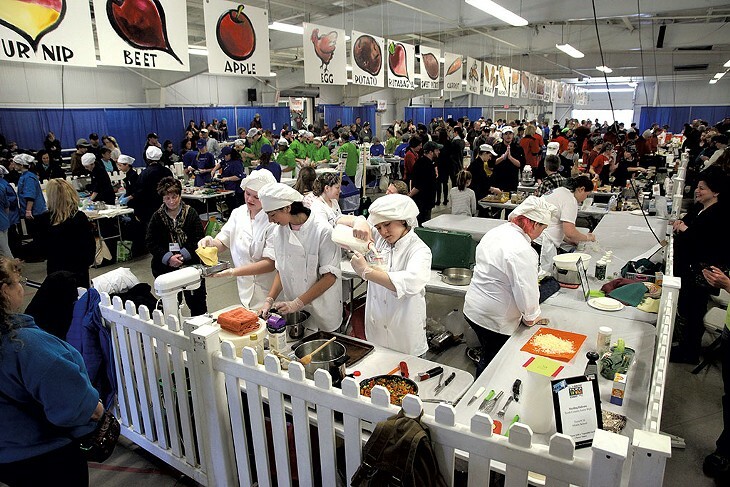 Held at the Champlain Valley Exposition in Essex Junction, the annual cook-off is organized by the nonprofit Vermont FEED (Food Education Every Day). 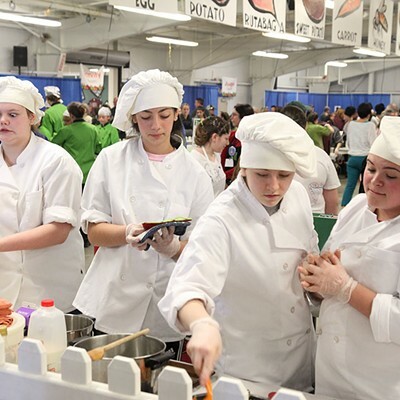 It's open to middle and high school students across the Green Mountain State, and in the nine years since its inception, more than 3,000 kids have participated. The hundreds of contestants are divvied into two independent sessions, half in the morning, half in the afternoon. This helps keep chaos in check; you can only cram so many makeshift kitchens into one space. It also reduces the number of aspiring chefs a judge has to disappoint in a day. I judged this year, and generally try to keep that number to less than 100, so it worked out nicely. When I arrived a little after noon, the space had been cleared of the morning's contestants, and the second batch was busy setting up. The kids were corralled inside a large rectangle by a white plastic picket fence. Each team had an L-shaped workspace no bigger than a queen-size bed, and onlookers could stand just inches away from contestants. After checking in at the much quieter judges' room at the back, I returned to the crowded competition floor. My mission: to observe two teams and ultimately award one a gold star for teamwork. My notes would be compared against others' to select two Mise en Place winners, one from middle school and one from high school. 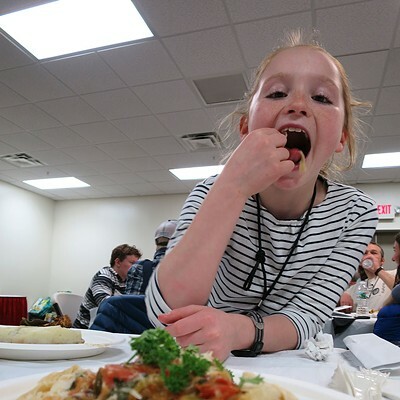 All the judges would sample the food to determine the Crowd Pleaser (best dish) and Lively Local (best use of local, seasonal ingredients) awards. But for now, we were just grading the kids on their communication and delegation of tasks. I made my way to the inside of the rectangle, located my teams in the far corner and spent an hour observing them. Team No. 16, dubbed the Sizzling Falcons, rarely spoke. 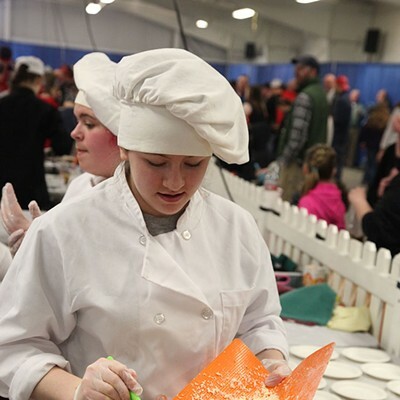 The four young women — Shawna, Francesca, Mercedez and Julia — worked efficiently in matching white chef coats and hats. Pink-haired Mercedez took over grating cheese when Julia moved to making fettuccini from scratch. The latex-gloved pasta maker fed her dough through a KitchenAid mixer attachment in expert motions. Mercedez then chopped vegetables with a tiny knife and sautéed them in a pan, and Shawna took over the cheese, pouring it into a pan. At times each of the other girls stepped in, helping to cut or stir the vegetables. For the better part of the hour, the team kept a pot of water at a boil. They wouldn't make the mistake of having to heat it up at the last minute. The team cleaned up as they went along, always wiping down the workspace. The last thing I observed was Shawna tasting a sauce, pausing, grabbing a clean utensil and asking another teammate to try it, too. It was a similar story with team No. 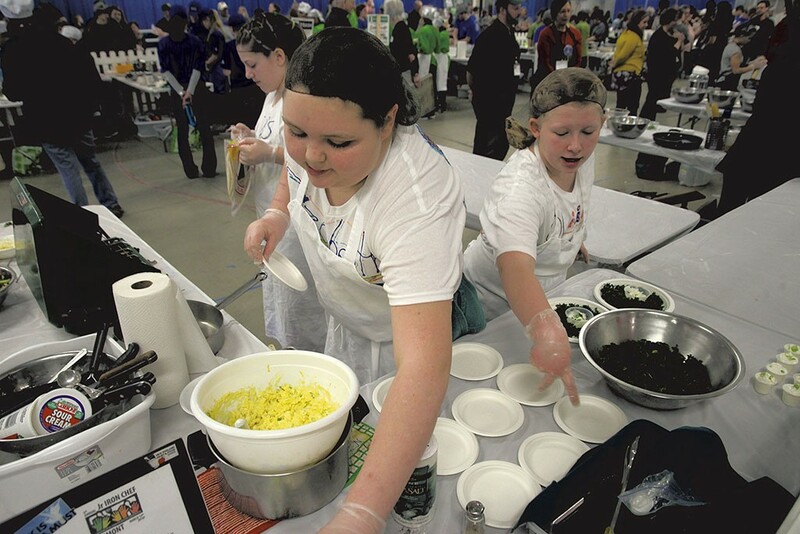 17, the Cooking Rockets: Elizabeth, Olivia and Alexis from Rochester Elementary/High School. Unlike the team-based cooking shows on TV, people weren't yelling. Everything was planned ahead of time, and everyone knew their job and when it had to be done. The girls knew Elizabeth was best at cutting onions without crying, so she took onion duty. That left Alexis in charge of dicing beets and Olivia on carrots. Together they would make a "double-egg-salad wrap" with a kale and root vegetable salad. Olivia and Elizabeth took turns massaging kale for quite a long time — I noted at least 11 minutes. No doubt because the team's adviser, Marcela Carroll, kept encouraging them to "massage, massage, massage." Do kids even like kale, I wondered? "I don't like broccoli or peas or green beans," Olivia confessed to me later. "But kale with some lemon juice and olive oil is pretty good." At one point, she paused with a lemon, cut-side down, over the greens when a spectator yelled, "Olivia, Olivia! Squeeze up!" The 11-year-old turned the yellow fruit 180 degrees (so the seeds wouldn't end up in the bowl) and crushed it forcefully. Lemon juice spritzed upward and gushed over her hand into the bowl. For a few more minutes the girls massaged — then they tasted. You should be able to swallow after three chews, they told me; that's when you know it's done. They chewed, stopped, discussed. "It's a little crunchy," Alexis said. 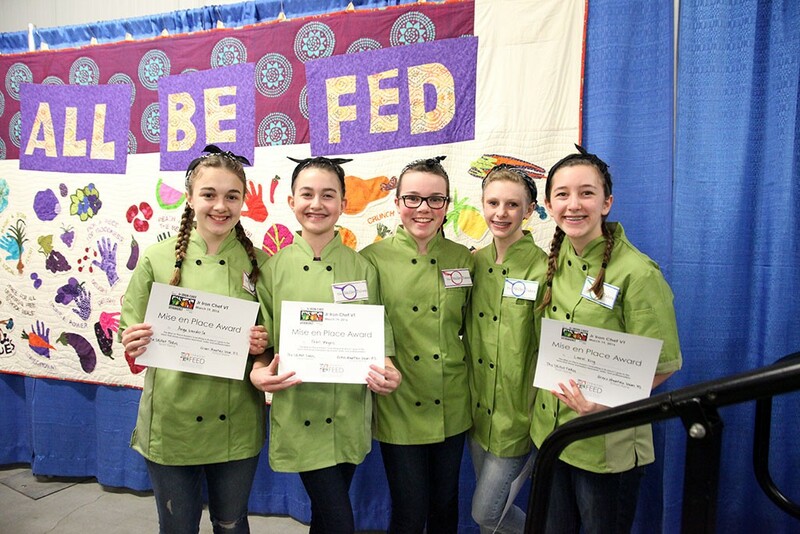 I left them with 30 minutes to go and assembled in the back with the 10 other judges, one of whom was also a kid: 11-year-old Peggy Fischer of St. Johnsbury, who had recently earned third place on the Food Network's "Kids Baking Championship." Collectively, we had to sample 26 dishes. The organizers split us into three groups and fed each a fraction of the total entries. 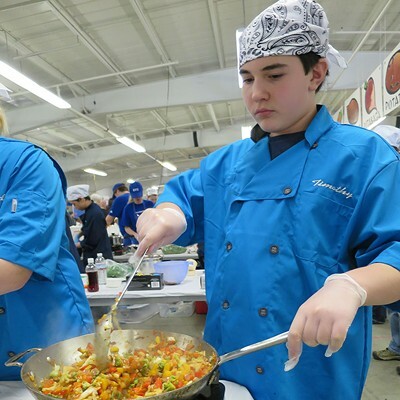 Each group then picked its three favorite dishes, which would compete with those of the other judges' picks. My group included Lisa Pendolino, managing director of the Ben & Jerry's Foundation; Julie Rubaud, owner of Red Wagon Plants in Hinesburg; and Emily Simmons, director of legal and policy services for the Vermont School Boards Association. Our first dish to arrive was a handmade vegetarian empanada, which earned kudos for its use of English peas. After much debate, we realized that the chefs had used both cilantro and parsley in the garnish — perhaps mistakenly grabbing both at the market. Next up was a smothered enchilada that replaced tortillas with quinoa. It earned high marks for its flavor, particularly the smokiness, as well as the perfectly melted layer of cheese coating each serving. A beet falafel surprised us with its creativity. And a perfect biscuit, served with broccoli soup, would have earned an award if judged on its own. When a charred pepper arrived at our table, Simmons said she had observed a boy toasting them using the tiny flame from a camping stove. Finally, the Cooking Rockets' double-egg salad made it to the table. After spending an hour getting to know these girls I'd formed an attachment, so initially I refrained from sharing my opinions. I winced when someone mentioned that the kale was too tough. An udon noodle bowl edged its way to the top of our favorites list (and would go on to win the afternoon's Crowd Pleaser award). The sweet-and-sour broth had depth and umami, and the accompanying handmade dumplings were tender. We all agreed this was a dish we'd pay for in a restaurant and that kids would gobble up in the lunchroom. I continued to sip the broth while we waited for the organizer to bring the next entry, which turned out to be the Sizzling Falcons' pasta. And it rocked. The noodles were tender and just the right size, and the Alfredo sauce was sublime. We wished the vegetable chunks were larger, but that's the worst thing we had to say about the dish. Turns out the group's nearly silent teamwork had paid off. Roasting vegetables, cranking out noodles by hand and making sauce from scratch, all on deadline, requires pro-level coordination and skill. And these middle schoolers pulled it off. 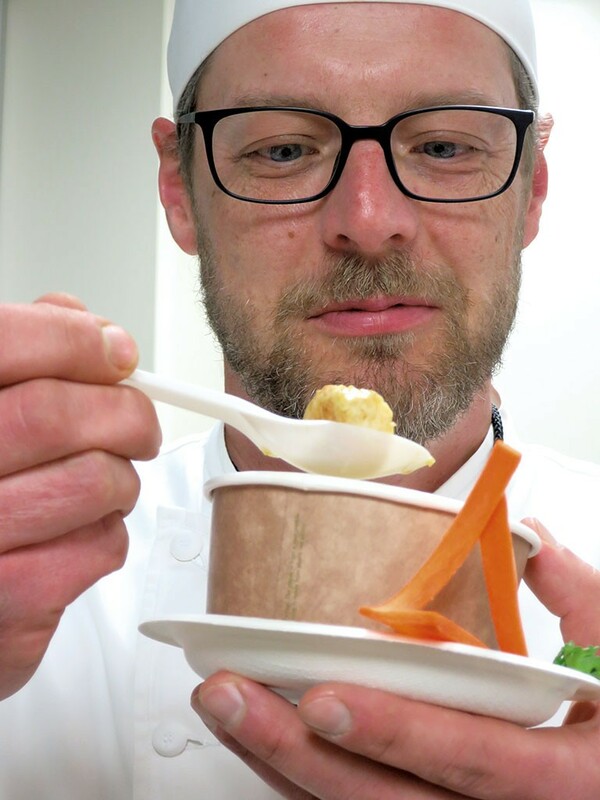 After the groups selected their three favorites, all the judges tasted the final recipes. 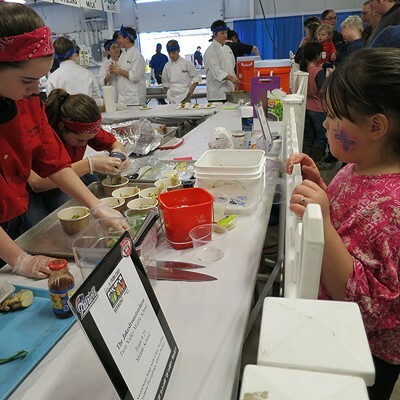 We were given two tickets with which to vote for best dish overall, and two winners, one from high school and one from middle school, were selected for both categories: taste and local. Neither of my teams won an award, but I wanted to hand out ribbons to everyone. 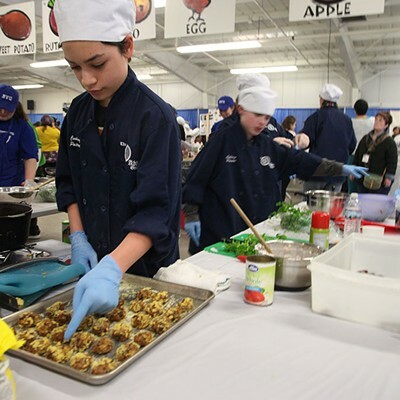 Adult chefs can take the heat; could the kids handle the competition's highs and lows? Alexis wasn't daunted. Despite defeat, she still wanted to be a chef. Both she and Olivia said they would compete again next year. "I thought it was exciting, an experience I would never forget," Olivia said. For future competitors, Alexis had this advice: "Have fun, be a team, cook what you like and don't worry about how people judge it." The original print version of this article was headlined "Ironclad Kids"